Today is Tuesday, and that means a guest post and link up! We’re thrilled to introduce you to Toni Campbell! She is a brave dreamer, who refuses to stay down, even when the journey gets tough. Thank you, Toni, for sharing your heart with us today! As a young girl, I’d never heard of “God-sized dreams”, but knew in my heart God would use me in a big way. I filled that journal with poems and stories, but even more than writing, I loved singing. So in college, I was sure that performing was the “big way” I’d be used. Why do we think Almighty God…The One who created US…THE Dream Giver…needs help to chart our course? But I was 18 and knew everything. Until I knew nothing. Within a year, my mother was diagnosed with breast cancer, my parents divorced, and a series of bad choices included dropping out of college and entering into a volatile marriage that would officially end 31 years later. In the midst of daily survival, I forgot there ever was a dream. I’d made such a mess of things…I often wanted to forget there was a God, too. The road back was filled with missteps, mistakes, and messes, but God’s in the restoration business. Just check out that promise in Joel 2:25. Oh, how often I’d cried over those locust-eaten years. The road back was also filled with hope, healing and a hunger to discover just what the “big way” was – from God’s perspective this time. No “help” from me. After many seemingly unrelated experiences, God brought it all together. On January 10, 2010, I met with my pastor to discuss leaving the walls of our church to impact our community. Several months later CommunityConnections was born. Local outreach has become a core value of our church. Hundreds of people have been blessed as they “leave the building” to serve the community on a regular basis in a multitude of ways. Hundreds more benefit from their practical acts of service. About two years ago, I returned to using that “creative writing talent” my aunt encouraged me to develop almost 40 years before, by blogging about those outreaches and life lessons. Then last fall, my pastor asked me to teach with him on sacrifice and service. Speaking was something I had secretly dreamed of doing for many years. In fact, I was slated to attend my first speakers’ conference the following weekend. As I addressed the congregation, something in me came alive! My God-sized dream is to challenge His church to care for their fellow man through practical acts of service by planning outreaches, then encouraging others to do the same through the written and spoken word. You’re never too old, or too far from God to be used by Him…so what’s your God-sized dream? Toni Campbell is mom to a grown son and daughter, and a new son-in-law. 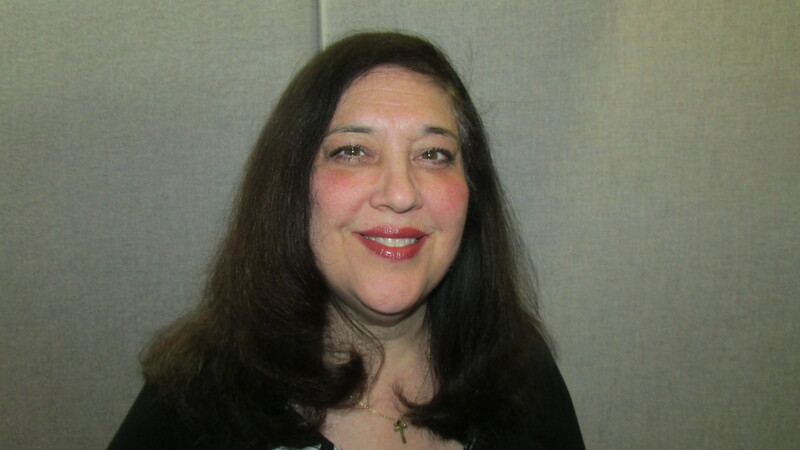 She writes radio commercials, devotions for The Quiet Hour, and blogs. Toni serves as the director of CommunityConnections, the outreach ministry of her church. Her passion is showing God’s love to others through practical acts of service (Gal. 6:9). Her life and ministry are living proof of the truth found in Ephesians 3:20 as God continues to do abundantly more than she could ever imagine. 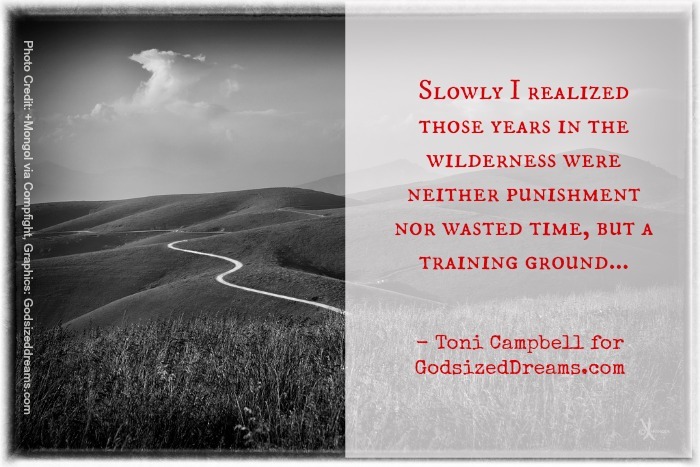 Toni feels closest to God near the water – down at the Jersey shore, near the Delaware River and especially walking along the shores of her beloved lake – the setting for her Lakeside Lessons blog. You can also find her on Facebook and Twitter. Rather than give a prompt, we’re opening the weekly link up to ALL God-sized dream posts! Share your story on your blog and link up with other God-sized dreamers. Such a beautiful post Toni!! Thank you for guest posting here and sharing how God has used you!! I know that your words will be a blessing to so many! Thank you for the encouragement Kristin…it’s my honor and privilege to share what God has done in my life! Thank you for sharing your story, Toni! Your words are powerfully encouraging, and it is a joy to get to know you through them. Thanks Mandy 🙂 I’ve enjoyed getting to know so many of you here on this site through your stories. So glad to have a chance to do the same! Thank you Toni! It is becoming increasingly clear that my God-Sized Dream is more than just becoming an author. It is also challenging the church to take up the torch of environmental stewardship that we seem to have laid down and forgotten somewhere along the way. Considering how the church feels about many environmental issues, that is going to be a tough task but with God all things are possible! I loved that line too!! it seared my soul and reduced me to tears for two reasons. One, I have seen how God has been restoring you over time (without knowing all the details of your wilderness) and the blessing you have become to me and everyone around you. Second, it mad me reflect on my own “wilderness” that I have been wondering around in over the past few years; losing the hope that my life would soon get better. However, reminding me that God does have a purpose for my life and He is true to His word has renewed my hope. He is in the restoration business- Joel 2:25! Thank you for being transparent and sharing some intimate details about your life. You have blessed me once more! Toni, your words today speak beautifully to me. I am starting to unearth my own dreams that I feel God is giving to me that I never knew I had. At least I never knew I would actually attempt achieving. And I’ve had so many people and circumstances put in my life by God that I would never had thought equalled me fulfilling these dreams…yet, here I am. It’s so wonderful to be under the care of a God so Big, isn’t it? I’m inspired by your story and I’m so glad you picked up your pen (or computer, as it were) and started writing again. You have a great talent and God will surely continue to use you. Bless you! Just love this story of faith and hope. A powerful reminder, Toni, that God will have His way with us…and He will make a way for us to live our best lives. So thankful you are sharing your gift of writing and speaking. Bless you! “God will have His way with us” – so, so true Elise!! And we are the better for it 🙂 Thank you for your kind words. What a wonderful story. Yes, it encouraged me to not to give up. Just keep on dreaming ang working and enjoyong the walk. I loved reading this Toni! So many times I have worried that I had wasted too many years. I love the perspective that it was not punishment nor wasted time, but training! It didn’t all feel like training, but looking back I can see that what you say is true. I shared your word picture on my Facebook page. I hope other people will rejoice in knowing their past was useful to God. What an inspiring post…Thank you! Thank you Dolly…I was blessed to be able to share just a little of the amazing way God has moved in my life!